In the central Rhodopes among richly nature and heavenly beauty, is located the "Holy Trinity" monastery - Cross Forest, or as it is shown on the Bulgarian map - The 'Cross' Peak. This 1545 meters high, above sea level, about 500 meters long and 300 meters wide, crossed woodland meadow is surrounded by dense beech forest with abundant lake streams. 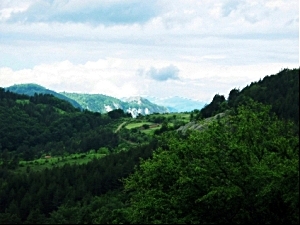 To reach this holy place, it's necessary to travel by road from Asenovgrad to Smolyan. Pass the Bachkovski monastery and when you get to the road fork for the town of Laki, namely - The Yugovski small inn, head to the south. 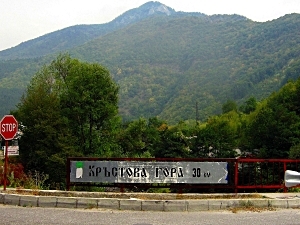 About 2 kilometers from Laki, turn left towards the village of Borovo and 6 kilometers after that, without deviations you'll get to the Cross Forest. In the mid 17th century a monastery was built, known back then as "Troitzkia" among thick beech forests. Today the complex consists of two churches "Cerement of Virgin Mary" and the "Holy Trinity", plus 15 chapels. The "Holy Trinity" monastery - Cross Forest has rooms for overnight rest, thus allowing its visitors to stay in the monastery, but do not forget, it's a monastery not a hotel. This is a holy ground and You should respect and honour that place. Prices per night are from 7 to 17 lv.